Yesterday, I had my lip pierced. Now, I say ‘had it pierced’, but in reality I actually did it myself, in the comfort of my own home. Yes, I know – the general advice to the public is that you shouldn’t do it yourself but go to a reputable piercer in your area. Well, the thing is that I don’t really know of any reputable piercers in my area, or any other areas for that matter. Sure, I could Google – but how do you gauge the validity of the piercer’s claim to always use sterile jewellery and fresh needles, really? They’re hardly going to state on their site “On occasion we run out of needles and just autoclave and re-use an old one we found lying around.”, or, “The table I’m using to lay down my tools on looks clean mainly because I wiped it down with an old rag seconds before you came in.”, are they? I’m not having a dig at piercing studios; in fact I do believe that, in general, shops offering to do body piercing are pretty serious about using anti-bacterial cleaning products and disposable needles etc, as it’s in their interest not to have clients coming back complaining that they contracted hepatitis from having their piercing done there. It would be very bad for business, indeed. All I’m saying is that as a client it is neigh on impossible to tell a good piercer from a bad one. Although, in fairness to piercing studios I general, it is highly likely that their piercing area is cleaned a lot more often than my would-be area, with or without anti-bacterials. Still, I had set my mind on going down the DIY-route. I had a number of reasons for this, including the much lower risk of cross-contamination; in short, piercing myself would involve only me and no one else – the philosophy being that whatever coodies already in my system wouldn’t hurt me any more than they already were. Also, and much more importantly, this was sort of a gift to myself. As some of you may be aware I suffer from severe major depression and that, on the rare occasion, I fail to resist urges to self-harm. NOT a very good thing to be doing to yourself, I know, but that’s what I do. (I was in two minds whether or not to write about this in such an open forum, but in the end I decided that this is reality and a lot of people manage their depressions in this way, and keeping a lid on it will help no one). So, back to my little story of self-piercing; I made a deal with myself quite a few weeks ago. In return for refraining from self-harming I’d give myself permission to – under as controlled conditions as possible – use this need to scar my body in a less destructive way. I’ve wanted a piercing for a long time, I think it looks really funky, and so, I figured this could be a good way to practise control over my wish to self-harm. This may make no sense at all to you, but to me it does, and I guess that’s what really matters. I’m not stupid (at least I’d like to think I’m not), so in the last few weeks I have spent a lot of time finding out the facts about piercing and self-piercing: the pros and the cons, the risks involved, what type of needle to use, what material the jewellery should be and so on. This was NOT an impulse (unlike my self-harm) and I think it is of utter importance to recognise the difference, not only for me, but for anyone contemplating home-piercing. Yesterday, having received the necessary equipment from various internet sources, I decided that the time had come. (Well, actually I had decided that already at the beginning of the week). I hadn’t told my partner about this, not because I thought he’d try to stop me or tell me I was crazy to do this on my own, but because this was MY journey. Lacking an autoclave I started out by boiling the jewellery. I had three to choose from and hadn’t yet decided which one I’d put in so I basically boiled all of them. They were meant to be clean and new, but I figured it wouldn’t hurt to do this as an extra measure of precaution. While they were happily boiling away on the cooker (for about an hour) I thoroughly cleaned the surface where I’d eventually lay out everything I’d need, using first bleach and then Dettol. On top of the surface I placed one of those “create a sterile surface”-sheets. [You know the pre-packed sterile first-aid style packs]. I then rubbed some Bonjela on both the outside and inside of the lip to numb it, swallowed an Ibuprofen and went on to cleaning myself, or at least my hands and arms. First just a normal wash down with soap and water, then a soak in the sink with lukewarm Dettol solution and finally a rubdown with an anti-bacterial hand gel. I allowed my hands to air dry since I didn’t want to use a towel, which doubtlessly would carry any number of bacteria. Hands clean I placed the now “sterilised” jewellery, the needle, some cotton balls, a brand new toothbrush, a surgical felt tip pen, a cup of Dettol solution and a cup of EasyPiercing Mouthwash on top of the paper towels I’d laid out earlier. After some research I had decided to opt for 1.6mm jewellery and had bought a titanium lip ring, a lip spiral of the same material (as this is a light weight material which contains no nickel) and a BioFlex labret with a push-fit titanium bead. As I mentioned before I hadn’t decided yet which one to actually put in, but I knew that these materials should be fairly safe to use from an allergy point of view. 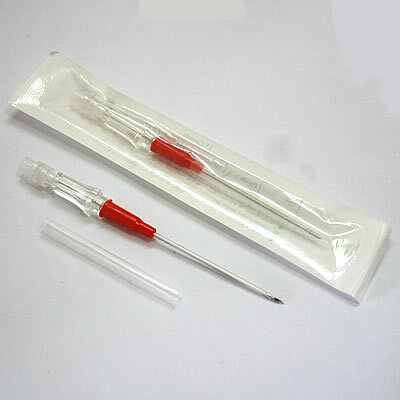 The needle was an 14g (2.0mm) sterile blister packed IV cannula made of surgical steel – the same type used in hospital to set up IV-drips. As it was supposedly sterile in the blister pack I had decided not to boil it, having first checked that the Use By-date was ok. I went through the routine of washing my hands and arms again, figuring ‘better safe than sorry’ before thoroughly brushing my teeth. I then swished the EasyPiercing Mouthwash for about 45 seconds to clean the inside of my mouth further, spat and dipped one of the cotton balls in the Dettol solution. I used this to clean the outside of my lip and chin before marking the spot where I wanted my piercing. I had been wearing a fake lip ring on and off the last few weeks to get a good feel for where I’d like to have it and had settled for the right side of my lower lip. After this I did another round of hand and arm cleaning, partly because I reckoned “what the heck, it won’t hurt none to do this again” and partly just to stall the actual moment of piercing. Hands once again clean show time was now approaching and I finally got the needle out. Wow! It wasn’t until I opened up the blister pack I really realised how HUGE these needles are. I’m pretty lucky because I’ve never really had a problem with needles, but I must admit that I had to take a deep breath when I saw this. I’m not in the medical profession and had never really looked at a cannula needle up close before, so I took some time understanding how it would work. Yes, I had looked at pictures on the net, but I think that mentally I needed to take it in properly with the instrument actually in my hand. I used my left hand to pull my bottom lip out, took a few deep breaths and used my right hand to push the needle through. Did it hurt? Not at all. Not even a little. These needles are so sharp they basically slice through the tissue (as opposed to for example piercing guns, which basically crush and tear the tissue using semi-blunt force). I didn’t really have to push much at all to get the needle through, save for the very last bit. I pierced my lip from the outside in, since that seemed the logical way to perform this little operation, but I know that many professional piercers will do it the other way around. So, there I was now, needle still poking through my lip, looking at myself in the mirror, feeling pretty proud of myself. I took hold of the cannula with my left hand to avoid it slipping and pulled the needle out. For those of you who don’t know a cannula is basically a small plastic tube which the needle sits in, so when you push the needle through the tube goes through with it, but when you pull the needle out the tube will remain in the piercing. The reason for using a cannula needle as opposed to just a needle on its own is that, apparently, it makes putting the jewellery in your fresh piercing a lot easier and a lot less painful. Never having performed this procedure before, I can’t really tell you if this is so, but I have to say that for me that cannula really made the insertion of the jewellery child’s play. I decided to go for the BioFlex labret and basically just pushed it into the cannula from the top and then pulled the cannula out, leaving my labret neatly in place inside the piercing. All I needed to do after that was put in the titan bead at the other end of the labret to secure it. Easy! All done I swished with EasyPiercing Mouthwash again, washed my face and ate a Dextrose tablet. (This is to avoid feeling light headed. If you don’t like Dextrose tablets a sugary drink will do just as well. Or an apple, for that matter!). So, there you are. My rather lengthy story about How I Pierced My Lip. Having done research online I know that there is very little detailed information about HOW to do this yourself, as most sites will merely say NOT to do it yourself. Personally, I think that it is up to each individual to decide whether or not to attempt this on their own. As long as you are an adult it really is up to you. Having said that, you are also responsible for any mishaps, and so, thorough research prior to piercing is highly recommended. Also, don’t forget to dispose of the needle in a way that will not put others at risk. Don’t put your dust-bin man at risk. He does a good job for you! A hot tip is to take it to your nearest hospital, as most hospital operate a service for returning used needles. They’ll probably assume you’re a junkie, but I reckon that’s minor compared to passing on your coodies to other innocent people – including dust bin collectors! Straight to the point information. Scary but brave. And I do get your reasons. I wanted to leave a thank you for this blog. I found it a few days ago and wanted to take some time to think about it before leaving a comment. Earlier last year my mother passed away, and I took it very hard. I’ve developed anxiety troubles with the oddest things, for some reason rain and thunderstorms now give me the serious jitters, I have earplugs for the thunder, and I usually bury myself in a book, or a video game till it’s over. I’ve noticed that I also have tried to change things in what I can only assume is an attempt to be different from what I currently am. I can totally understand the piercing draw, I’ve cut my hair into an adventurous way, changed my clothing styles, grown out a beard and removed it numerous times over the course of two years… I’ve never self harmed, but I wont say I’ve never thought of it. I have ocd that keeps me up some nights over a single dark thought, I’ve thought about getting a tattoo, and with a very heavy lack of funds at the moment I started doing research on piercing myself instead. I feel like just as you said it’s a release of things, for me it’s about making myself different, fighting to be brave again. Before my mother passed, there was virtually nothing that scared me, I actually reveled in storms. I feel like your blog is a beautiful thing, and it’s inspired me to actually do what I’ve been thinking of doing for a while now. I’m going to be piercing my ear cartilage in the coming week (when I get the supplies all together) and I felt the need to tell you that your experience, reading your blog posts over the past week have given me inspiration to keep on fighting. It’s given me the drive that I haven’t had since I read the Divergent series a few months back and realized that what I wanted most was to be Dauntless, like Triss; if you haven’t read the series, it’s a compliment to say you sound pretty similar to her. Very long post, tldr version? Thank you for inspiring me to be brave and do what I’ve been dreaming of for a while. Firstly, let me say thank you for sharing your experience here on my blog. It takes a lot of courage to write about your thoughts and feelings, especially in an open forum [a lot of people choose to email me instead], and I am glad that you did, because I think other readers will come across what you wrote, and be comforted by it. I think it makes perfect sense to have a need to do or change something on the outside, when both your internal and external world is throw into turmoil by something so difficult as losing a parent. Something very big happened, and it changed something inside of you – so I think it is quite natural to want to change something on the outside, too – to somehow signal to the world that something is different. I also think that it is completely understandable that your anxieties got worse after this very tragic life event. How could they not? Once again, thank you so much for sharing, and for the very kind words about my blog. Do take good care of your Self. PS. I haven’t yet read the Divergent series, but I think I may have to, now.